The Western Regional Executives of the ruling New Patriotic Party (NPP) have challenged Ace investigative journalist of Tiger Eye PI, Anas Aremeyaw Anas, to produce raw footage to the security agencies for the necessary investigations over his latest 'Galamsey Fraud' video. In a documentary produced by investigative journalist, Mr. Anas Aremeyaw Anas, Mr. Bissue, who is also the Secretary to the Inter-Ministerial Committee on Illegal Mining (IMCIM), was seen on video taking money to allegedly facilitate for an unlicensed company seeking to circumvent laid-down processes to be given clearance for its mining operations. The undercover investigator, in his latest piece, captured on video some persons tasked with the fight against illegal mining, popularly known as ‘galamsey’, receiving various sums of money, ostensibly to facilitate the acquisition of mining licences. In a statement issued by the Regional Executives and signed by its Regional Chairman, Mr Francis Ndede Siah indicated that the party doesn't condone any act of corruption and therefore challenging Anas to provide the unedited footage of his latest galamsey exposé which has allegedly captured Mr. Charles Bissue of taking bribe to assist some people to engage in illegal mining activities. 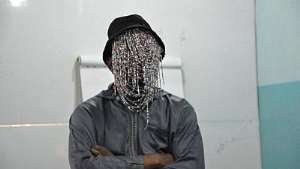 According to the Regional Chairman, they want the matter to be finalised and that is why they are challenging Anas to produce the unedited footage to the security agencies for interrogations. "Therefore, we as Regional Executives, move to add our voice to the numerous calls by all well-meaning Ghanaians that Mr. Anas Aremeyaw Anas should produce the unedited footage for the security agencies to carry out the necessary investigations. In as much as we would not condone any acts of corruption, we as Regional executives and Ghanaians for that matter seek to see the matter finalised, and more importantly knowing who Bissue is, that's why we have added our voice today", the statement challenged. The statement testified that Mr. Bissue is incorruptible person, loyal and committed person who has been discharged his duties diligently. The statement added that they saw Anas' video to undermine the integrity of Mr. Charles Bissue. "As a Region, the Charles Bissue we call a colleague, has discharged office as a Regional Secretary without any corrupt activities, thus, it came as a surprise when one journalist (ANAS), sought to undermine his integrity with a video that went viral", the statement said. The statement believed that Charles Bissue is an innocent and therefore appealing to government to expedite the process "and if indeed Charles Bissue is guilty the laws of the land should take it course but if Anas is also buying time to delay the process, he should be impressed upon to respect the state agency by submitting himself to authority and made to follow due process". On behalf of the Western Regional Executives of the ruling NPP, we wish to state unequivocally that, Mr. Charles Cromwell Nana Banyin Onuawanto Bissue (Regional Secretary) is a loyal and dedicated member of the Western Region and has executed his duties impeccably. We as Regional Executives can vouch for his values, principles, and capabilities; that when it comes to Party activities, Charles Bissue is outstanding. He is very loyal, committed and dedicated to every task assigned him, both at the National and the Regional level. As a Region, the Charles Bissue we call a colleague has discharged office as a Regional Secretary without any corrupt activities, thus, it came as a surprise when one journalist (ANAS), sought to undermine his integrity with a video that went viral. Therefore, we as Regional Executives, move to add our voice to the numerous calls by all well-meaning Ghanaians that Mr. Anas Aremeyaw Anas should produce the unedited footage for the security agencies to carry out the necessary investigations. In as much as we would not condone any acts of corruption, we as Regional executives and Ghanaians for that matter seek to see the matter finalised, and more importantly knowing who Bissue is, that's why we have added our voice today. By this release, we are appealing to government, to expedite the process and if indeed Charles Bissue is guilty the laws of the land should take its course but if Anas is also buying time to delay the process, he should be impressed upon to respect the state agency by submitting himself to authority and made to follow due process. We are of a firm belief, that, Charles Bissue is innocent, but we also want the rule of law to take its due cause. In conclusion, we are appealing to the president, H.E. Nana Addo Danquah Akufo Addo, and the necessary state authorities to compel Anas to do what is expected of him and if not, we as a Region will advise ourselves.